"Cheers to Exceptional Living" - Raise a glass to exceptional living in western Bonsall, where this newer estate encompasses a gracious single-level residence and a 435-vine Pinot Noir vineyard. Southwestern views across over hills, valleys and romantic starlight. Sprawling lawns, patios, a vegetable and herb garden, and an outdoor kitchen with 2 BBQs, built-in ice chest, bar seating and a farmhouse sink are featured on the fully fenced, pet-friendly 2.05-acre homesite., Discover the rewards of tending your own grape vines, or allow the professional vintner to do it all. Views of the vineyard and beyond enrich the open and spacious interior living areas of the 4-bedroom, 3.5-bath home, which spans approx. 3,577 s.f. Travertine flooring, high ceilings and plantation shutters characterize a bonus/game room, formal dining room, luxurious fireplace-warmed master suite, and a large family room with fireplace and media niches. Granite countertops and dark-stained wood cabinetry are showcased in an island kitchen with bar seating, nook, butler's pantry and stainless steel appliances. 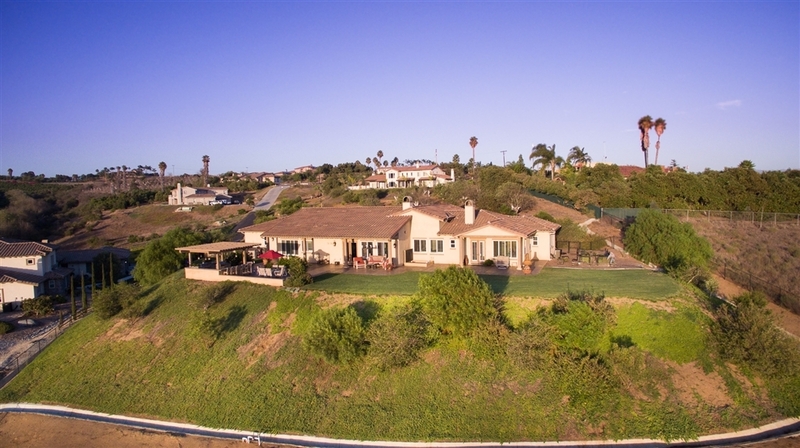 Served by Top 10-rated schools, a big attraction for residents of Bonsall, the estate is located near equestrian and golf attractions, shopping, recreation, dining and San Diego County beaches.